Total absolute magnetic fluxes on the Sun for three models: solid/blue: flux estimate (Tapping et al., 2007) based on a partitioning between ‘strong field’ and ‘weak field’ components, scaled from sunspot numbers using their equations (1) and (4); dashed/green: a multi‐component flux model (Vieira and Solanki, 2010) (with time‐dependent couplings, multiplied by 1.25 (going back to 1700); diamonds/red: flux‐dispersal model based on the yearly‐average sunspot number (Schrijver et al., 2002), with points from July 1996 onward based on assimilated magnetic maps (Schrijver and DeRosa, 2003) based on SOHO’s MDI (Scherrer et al., 1995) sampled once per 25‐d period. The multipliers are chosen to bring the fluxes around 2000–2003 to a common scale. 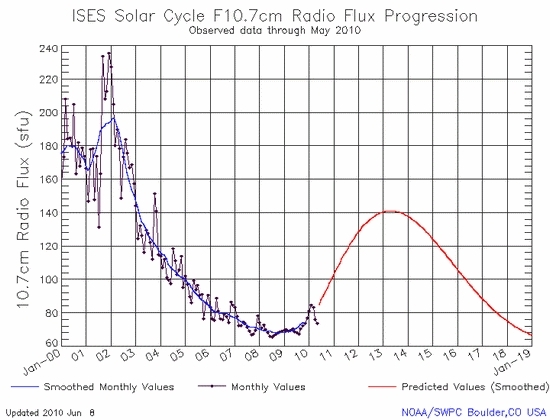 The horizontal dotted line shows the flux level characteristic of August‐September 2009. This is a new paper in Geophysical Research Letters by C. J. Schrijver, W. C. Livingston, T. N. Woods, and R. A. Mewaldt. WUWT readers may recognize Livingston as the creator of one of the datasets we regularly follow graphically on our Solar Data and Images reference page. Figures 1B, 1C and 1D from the paper: The average of three different reported composites (ACRIM, PMOD, and RMIB) adjusted to match the SORCE/TIM absolute scale. The grey shading indicates the standard deviation of the three composites. 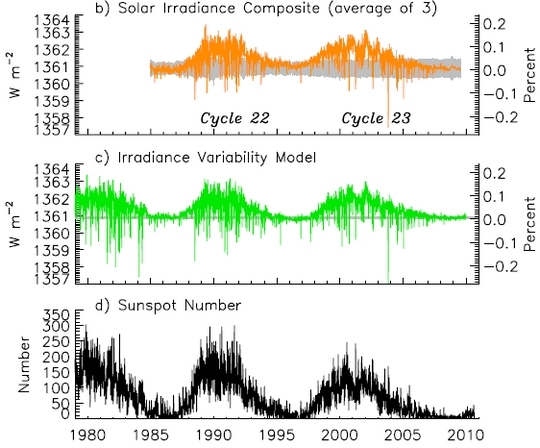 (c) Irradiance variations estimated from an empirical model that combines the two primary influences of facular brightening and sunspot darkening with their relative proportions determined via regression from direct observations made by SORCE/ TIM. (d) The daily sunspot numbers indicate fluctuating levels of solar activity for the duration of the database. 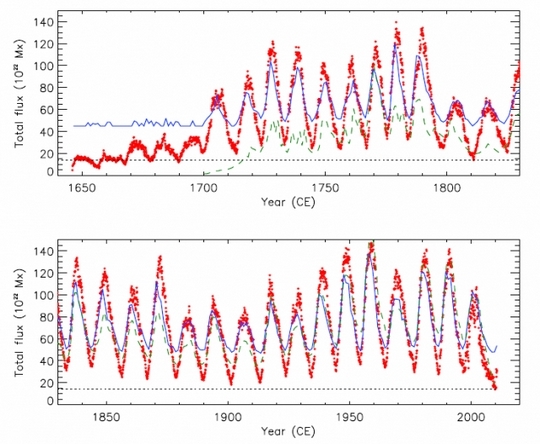 The most probable value of total solar irradiance representative of solar minimum is 1360.8 ± 0.5 W m−2, lower than the canonical value of 1365.4 ± 1.3 W m−2 recommended a decade ago. This new value, measured by SORCE/TIM, is validated by irradiance comparisons to a NIST‐calibrated cryogenic radiometer in the new TSI Radiometer Facility. Uncorrected scattering and diffraction are shown to cause erroneously high readings in non‐TIM instruments. NOAA’s Space Weather Prediction Center (SWPC) produced their monthly solar cycle progression update yesterday. The news is not encouraging. We’ve had a drop in solar activity again in December, The sunspot count is lower, but the really worrisome thing is the Ap geomagnetic index. 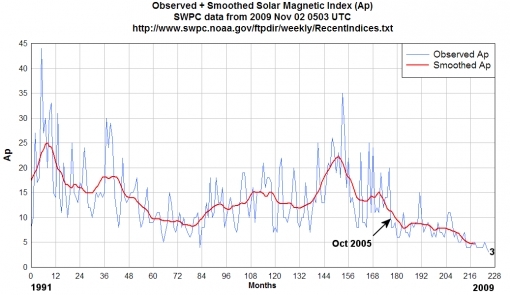 The solar dynamo has now dropped to magnetic activity levels last seen in late 2009. Readers may recall this post from December 23rd: Solar Geomagnetic Ap Index Hits Zero which was a bit unusual this far into cycle 24. The University of Colorado at Boulder’s Laboratory for Atmospheric and Space Physics and NASA’s Goddard Space Flight Center in Greenbelt, Md., today announced the formation of a new collaborative research center dedicated to the study of the sun’s effect on Earth’s climate. The center, called the Sun-Climate Research Center, or SCRC, will be co-directed by LASP Research Scientist Peter Pilewskie as well as Robert Cahalan, who heads Goddard’s Climate and Radiation Branch, and Douglas Rabin, head of Goddard’s Solar Physics Laboratory. The dark line is a linear least-squares fit to the data. 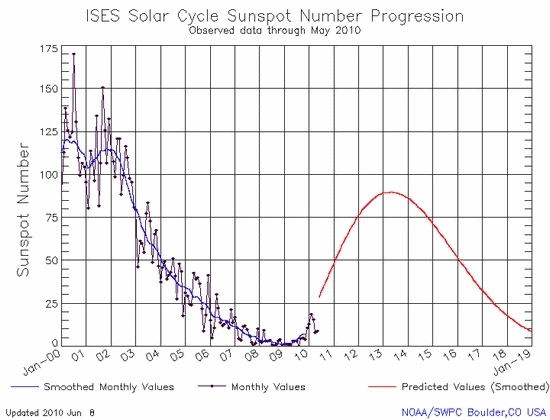 If the trend continues exactly as shown (prediction: it won’t), sunspots will become a non-stop daily occurance no later than February 2011. Blank suns would cease and solar minimum would be over. If the past two years have taught us anything, however, it is that the sun can be tricky and unpredictable. I’ve looked at the Ap Index on a regular basis, as it is an indicator of how active the solar dynamo is. When we had sunspot 1029 recently, the largest in months, it gave hope to many that Solar cycle 24 had finally started to ramp up. After an exciting encounter last week with some genuine sunspots that weren’t arguable as specks, pores, or pixels, the sun resumes its quiet state this week. People send me things. Here’s the latest email from Paul Stanko, who has been following the solar cycle progression in comparison to previous ones. 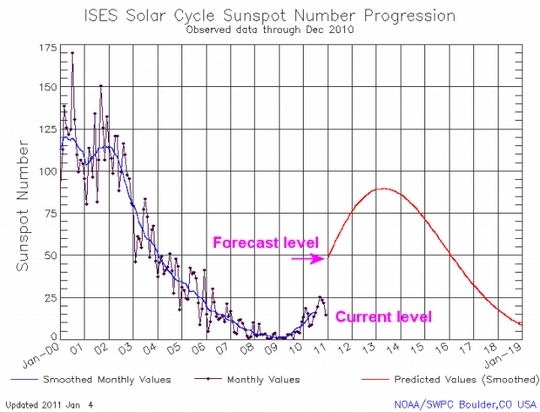 Out of the numbered solar cycles, #24 is now in 7th place. Only 5, 6, and 7 of the Dalton Minimum and cycles 12, 14, and 15 of the Baby Grand Minimum had more spotless days. Since we’ve now beaten cycle #13, we are clearly now competitive with the Baby Grand minimum. It has been awhile since I’ve looked at the Ap Index. The last time was April of 2009.